I never used to worry about boiling eggs, but at this elevation I have had all manner of problems. I had tried Elise’s method for boiling eggs which sort of worked, but still resulted in mangled peeled eggs. Once I pricked the base of the eggs and used Elise’s instructions, I was golden. They peeled beautifully (and I even used relatively fresh eggs). Despite loving deviled eggs and eating my fair share at potlucks and parties, I had never thought to make my own. I did a little research and found that deviled eggs are anything you want them to be. How sweet! 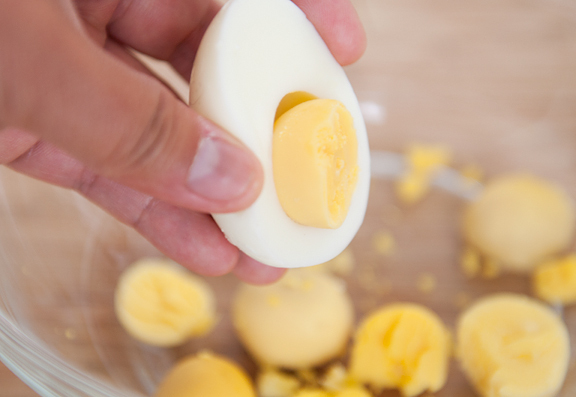 The reason I never learned to boil eggs that are easy to peel is because I always chopped up my hard-boiled eggs to toss into salads or to make egg salad. It just didn’t matter what the egg looked like, although it takes forever to peel when the shell sticks to the white. With deviled eggs, if you’re planning to serve these things to anyone other than yourself (please don’t tell me that you can eat a dozen by yourself) it looks tremendously better if the whites aren’t decimated. Kitt’s deviled eggs were fancy with shrimp meat and Sriracha sauce (they were awesome). I went with a more standard blend of chopped green olives, shallots, mustard, and a dash of Tabasco. Okay, more than a dash – I love that hot sauce. A word of advice if you use chopped olives and a piping bag: chop the olives fine enough that they don’t clog your pastry tip. Deviled eggs are fundamentally easy to prepare, but I love the variety of ingredients you can add to the filling to make it your own. I’ll have to experiment with more combinations this summer. What’s your favorite? 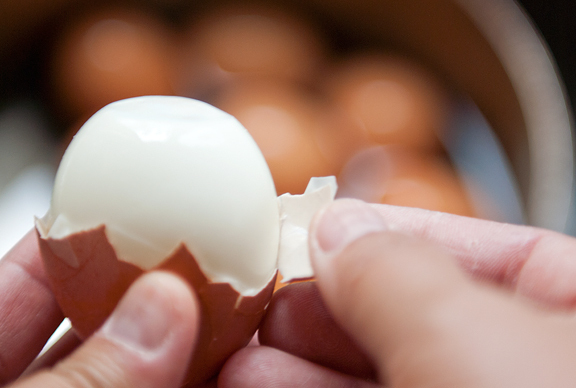 To boil the eggs: First poke a hole through the base (the rounded end, not the pointy end) of each egg’s shell. Use something like a pin or needle and take care not to slip and/or stab yourself. Place the eggs in a medium to large saucepan and fill with cold water until covered by at least an inch or two of water. Set the saucepan on high heat and let the water come to a boil. Let boil for a minute. Remove the pan from heat and cover it. Let sit for 12 minutes. Rinse under cold water. Peel the eggs. Slice each egg in half lengthwise so the two halves are symmetric. Pop the yolks out into a bowl. 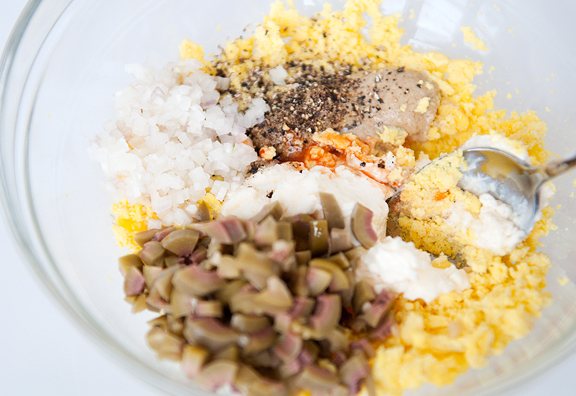 Mash the yolks and add the mustard, mayonnaise, olives (if using), shallot, Tabasco, salt, and pepper. Mix well. Spoon or pipe the filling into the egg white halves and sprinkle with paprika. Makes 24 deviled eggs. Did you peal your eggs warm or cold/chilled? I don’t know what it is called, but you can buy a gadget that punched hole to an egg. Very handy. If you cannot find it in the US, let me know, I can get you one from here. Here is NL. I can’t wait to try that hole in the bottom trick. Nothing is worse than ripping off big chunks of white with the shell. One of my favorite Deviled egg combos is adding crisp bacon pieces and grated cheddar cheese to the filling. 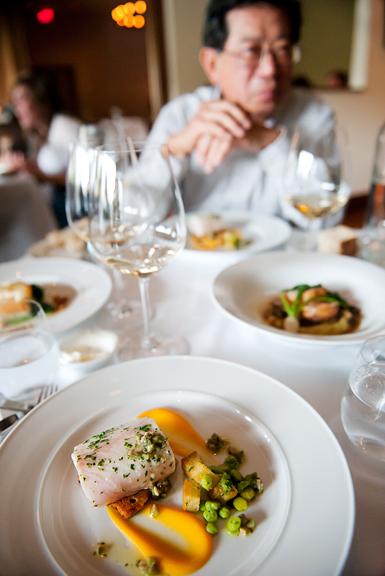 Love the single serving mini-plates in the last photo. I have also been punching eggs for as long as I can remember. IT does stop them from cracking but does not always help making them easy to peel. What does seem to help is for the eggs to be at room temperature before boiling them. Good luck. I love deviled eggs :) As another Colorado resident I too had a problem boiling eggs because the typical 10 mins, remove from heat and cover didn’t work–got to go longer! I’ve never had a problem peeling eggs, but then again I’m weird and like to peel eggs too. I have a fun little tip for you though, if you want to make sure the yolks are smack in the middle then place the eggs on their sides about a day before you want to use them. I just open carton, pull the eggs up out of their little sections and position them on top and it works just great! I do this now because in the past some of my yolks were too close to the edge and when I went to pop out the yolks the white would break or tear because it was so thin on one side. I am really excited to try the hole punching method! I’ve just ran my hard boiled eggs under water, which seems to help some, but has always left me with guilt about wasting water. Cool! i love that photo of your parents sitting next to each other. your mom is beautiful! and they are eating well no? enjoy their company. and also, i love deviled eggs! I make deviled eggs all the time. I usually get my eggs super fresh from a friend’s chickens and have heard many times that old eggs are easier to peel than fresh ones. The best tip I’ve been given was to steam the eggs. I got the recipe from friends at cooklocal.com. Steam the eggs in a basket for 25 minutes, place in an ice bath and peel. Easy peasy. Yours are way prettier than mine! Glad to be an inspiration. Sara, putting the eggs on their sides is a great tip. Thanks! 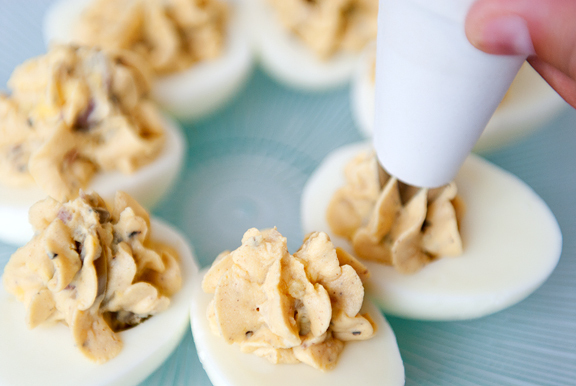 Here in the South deviled eggs are a staple. Yours look delicious!!! I have a friend who makes hardboiled eggs all the time and she says the secret to easy peeling is make sure the eggs are not super fresh. Like a week old. <—Now that has pros and cons in that tip, I realize, to use less than really fresh eggs, but she claims it's a tip that works every time! I make mine with mustard, a little mayo, a few dashes of worcestershire sauce (not too much or it will turn the yolks brown) and some sweet pickle relish juice, dash of tabasco, salt and pepper. 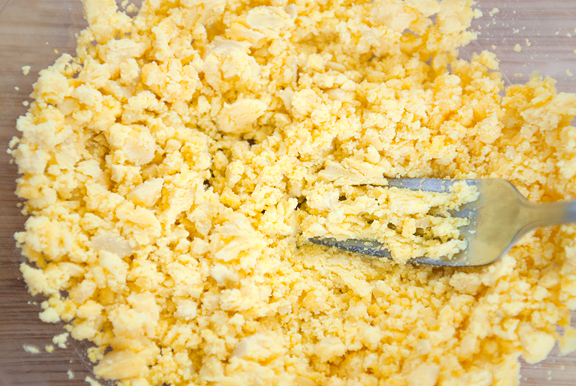 Adjust ingredients to how many eggs you are making and to your taste. Sometimes I just use the juice of the sweet pickle relish if people don’t like the texture of the relish in their eggs and sometimes I add some of the relish with the juice, which is how my family likes them. Yumm, I think I’ll go make some right now. That’s so exciting that your parents bought a place in Boulder. It’s also very exciting to have moved beyond grad school furniture. I’m jealous, as I’m still impatiently awaiting that day. I’ve just recently (re)started a deviled egg kick myself! I love taking 2 eggs worth for a part of lunch. I often make mine with curry powder. I love the combination of mustard and curry powder. And then you can spice that up further as you please to bring out the curry flavor. It’s fantastic your parents will be in Boulder. I’m always hoping my parents will move to the town close to us. Family time is the best! Enjoy yours! Your parents such a beutiful couple! How cool that you’ll be able to see them more often. 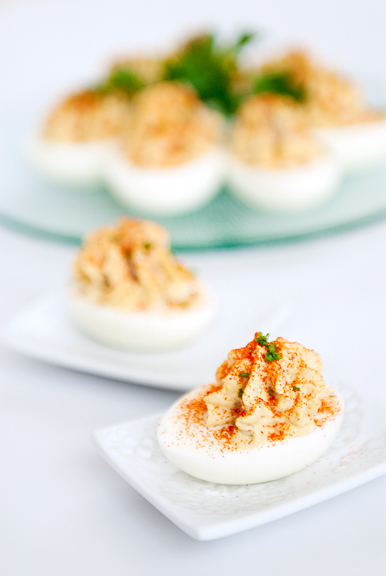 Your deviled eggs look so perfect! Our favorite ones are with toasted mushrooms. Saute onions and mushrooms (separately) to a golden color. Then mix with yolk mixture. Yum yum. That is so sweet about your parents getting a place to be closer to you. It touches my heart. I have an easier method if you guys would like to try that works just fine, no stabbing! After I boil my eggs to the consistency I want [hard/soft-boiled] I drain the water till there’s only enough to cover the bottom of the pot then add a bunch of ice, the ice cold water cools the eggs down and makes it easier to peel as well, and if only left for a while till the shells are cool to the touch, the egg inside is still warm/hot! I swear by my new-found method of cooking the eggs, which includes a soak in an ice bath at the end with baking soda to release the shell. 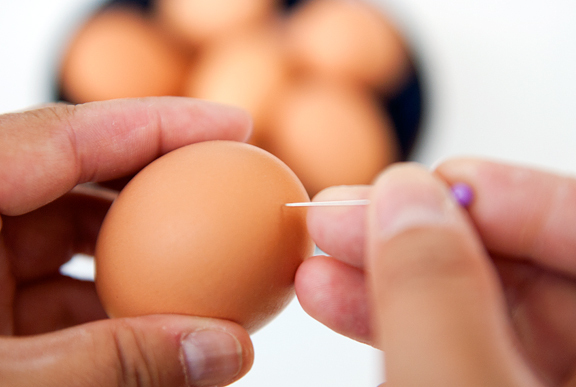 I originally found that from a video on the web that shows how you can blow the egg out of a small hole in the end! Thanks for the tip about poking the egg! I find that if I let the eggs thoroughly cook and then peel them under running cold water, it usually does the trick too. I adore deviled eggs! I usually put mayo, salt, pepper, finely chopped scallions, and worcestershire sauce. I also transfer mine from the boiling water and into an ice bath immediately and that usually results in easy peeling and no unsightly green ring around the yolk. those look lovely. i’m fond of wasabi deviled eggs, or chipotle mayo mixed in or plenty of spanish smoked paprika topping on relatively plain insides. 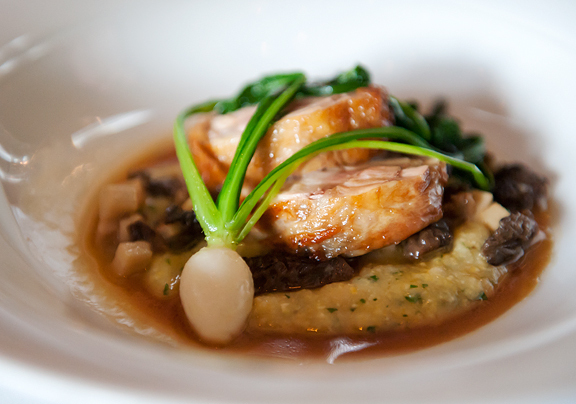 If you’re in northern California, go to the Dutch Goose in Menlo Park. They have all sorts of burgers and sandwiches, but they are famous (locally at least) for their spicy deviled eggs. Reeeeeaaallly tasty. I love your recipes and got to be a master dumpling maker this winter. I enjoyed the cleverness of cheesecake in a jar as a great way to recycle jars. Every time I look at your blog I think of my daughter in Crested Butte. Check out the Ginger Cafe, if you are ever there. She works there. She also lived for a time Boulder as a student and I have encouraged her to follow the blog as she has some similar interests. I hope that you are compiling a book! Thanks for the pin technique. I will try it. I love deviled eggs and make a recipe similar to yours but without the olives. My kids love them too. A decade ago I enjoyed spicy deviled eggs topped with festive red roe at a catered event, and was delighted to subsequently find the recipe in the award-winning chef’s book. They’ve become a favorite of mine to take to parties. One of our regional food columnists published a book devoted to entirely deviled egg creations containing good preparation tips and 50 quite varied recipes that have been lots of fun fun to try. While many think of deviled eggs as old-fashioned, no casual reception or picnic is complete without them here in the southeastern US, and none are ever left over to take back home. Most platters hold 24 halves, but I always prepare 14 eggs in case a couple don’t peel properly; using older eggs helps insure easy peeling. If some end up less than beautiful that’s fine… egg salad is delicious too! I looove deviled eggs. My stomach is a bottomless pit where they are concerned. I have never had trouble peeling them in my life and didn’t even try to use older eggs, and then every time since the past holiday season, they have been a disaster. I will have to try your pin trick and I hope it works. I need my deviled eggs, dammit! Use a push-pin or a thumbtack! Also, if you put the cooked eggs in an ice bath for say 10 minutes, then crack them slightly, they’ll peel with the greatest of ease. I am the last person on earth to ever give advice on anything related to cooking, however when it comes to hard boiled eggs? This I know! My Mom used to make Hail Mary Hard Boiled Eggs and they came out perfect every time! Here’s how I’ve made them for the last 10 years and they always turn out great – even in CO! Start with ice cold water in a 2 quart pot and bring the eggs to a gentle rolling boil. Remove from heat and cover pot. Say one decade of the Rosary (since I’m Jewish, I set the timer for 15 minutes). Empty the water the eggs have been cooked with and immediately fill the pot with ice cubes and add cold water. Replace the lid and say another decade of the Rosary (another 15 minutes on the timer). Peel eggs under running cold water (a small stream will do) and voila, perfect eggs! I am constantly amazed that this most perfect food, can be such a challenge to hard boil! My mother told me to cover in cold water, bring to a boil, remove from heat, and let set for 22 minutes. But then, she also told me if I don’t know how long to cook something, cook for 22 minutes. Her theory doesn’t always work…..but often it does! 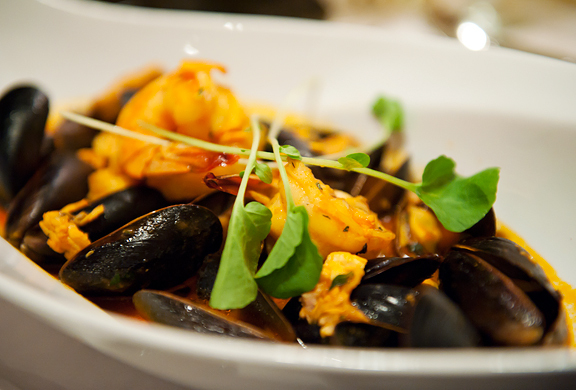 Your eggs look perfect, the presentation….simply divine. 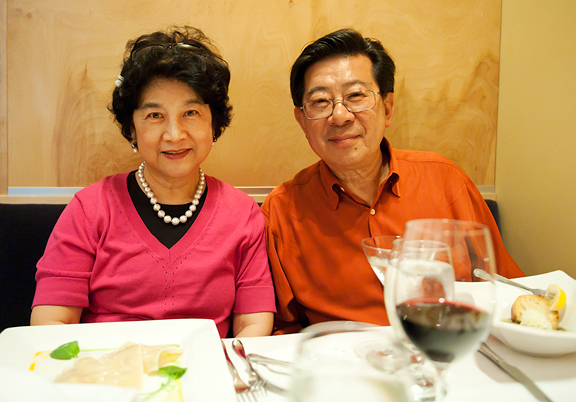 Love the pics of your parents! Can’t wait to see pics of your new dining table! 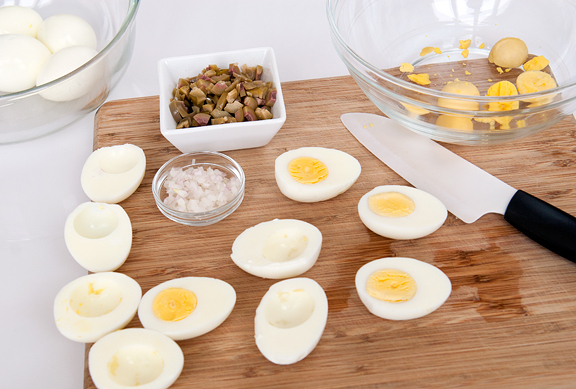 Have yet to find the perfect method for hard boiled eggs…will try this! I enjoy deviled eggs a lot, but nowhere near as much as my husband. These sound delicious with the olives! Too bad I didn’t see this post earlier today. The hard boiled eggs I made looked like moon rocks! I love deviled eggs too, but I never make them (because of the moon rocks). I’ll have to give the pin method a try next time. P.S. Your parents are too adorable! I’m sure it will be nice to have them close by. the ice bath always makes the white stick 10x more to the shell, it’s never worked for me! instead, after about 4-5 min in boiling water, i take the back edge of a butter knife and crack the shells while they’re cooking. i’m usually peeling them for salads and whatnot anyway too, so i don’t mind how the shells look coming out of the water. i’m trying to get my parents to move to boston where i am. it’s hard to convince them to leave southern ca though! I love deviled eggs, but do not like them with sweet pickles. 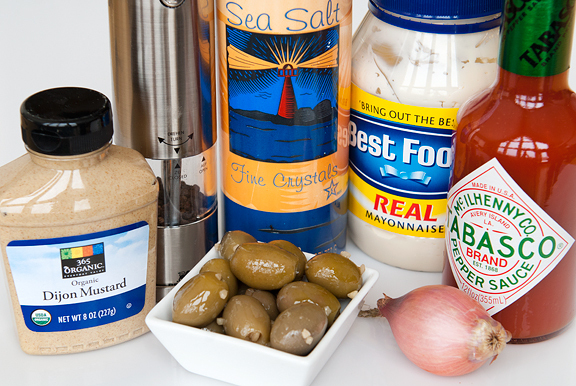 I use mayo, dry mustard, worchestershire, a touch of vinegar, a splash of hot sauce, salt and pepper. YUUUM. i will try your recipe it sounds wonderful. Well, dang. I tried this technique and it still didn’t work for me! The side closest to the pin hole peeled nicely but then the other side looked horrible. I am so close to giving up, but I love deviled eggs so much I don’t want to! Apron Appeal – I peeled them while still warm, although I rinsed them under very cold water. cindy – thanks :) I think I can find them around here somewheres. Bing Chou – thanks! I think they’re actually sauce thingies. I don’t know what they are intended for specifically. Sara – I will DEFINITELY try that! Thanks! Sonja – steaming? I’ve never tried it, but it makes perfect sense. Thanks for the tip. Averie – I’ve heard that too, but even using week old eggs, I get serious stickage and I think it has a lot to do with my elevation. Nadia – thank you! And I love your add-ins for the deviled eggs! Jeanne – ha ha, well… there is a long story behind this, but I eventually convinced them to get a second home here. They were looking for a while and I made it clear that eventually I want them to settle near me permanently. It just makes it better for me to care for them as they age since my sister is no longer here (they probably would have bought a house near her because of the grandchildren). Cooking with Michele – wow, I’ll try to remember that for next time. Kimberly – thanks! I really dislike the green ring too (and rarely am able to control if it shows up or not). alice – true, Boulder is 5300 feet above sea level and I’m 8500 feet above sea level. Interesting tip though, thank you. Roberto – thanks for that bit of info! Lizzie – ok, I’ll have a look at that. Kath – I love this, and you. Thanks, friend. Susan – thanks sweetie, I’m happy to have them nearby more often (but they’re still living mainly on the east coast). Here’s the basics. Pressure steam the eggs in a pressure cooker. Add 1 cup water to your cooker, put in a trivet or steamer tray to keep the eggs above the water. Lay the eggs in so they have a little space between each. Heat on high until you get to Low pressure. Time for 5-6 minutes after you get to pressure. Turn off or remove your pan from the heat. Let the pressure come down naturally without running water over the cooker (5-7 minutes). Open the cooker, cool the eggs in water or ice bath. You can refrigerate them if desired. When you peel the eggs the shells come right off. If you over cook your eggs, you’ll get the green line between the yolk and white, cut back on the time a little to solve this. 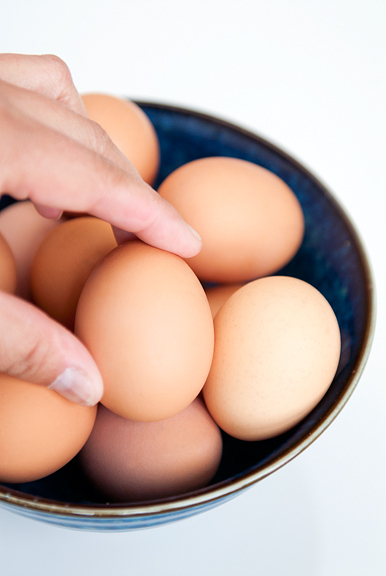 You may need to increase or decrease time depending on how big your eggs are. 6 minutes cooks X Lg eggs in my cooker perfectly.